Bang, bang, bang, BANG (that was careering from side to side in the ditch), bang bang bang BANG (that was smacking into the concrete culvert) bang bang BANG (that was Sabbatical Man smacking his head repeatedly on the steering wheel, moaning: “stupid, stupid, stupid”. Fortunately I was the only person in the family to experience the thrill of the complete off-road experience because Small, Medium and Large had just been dropped at school and Sabbatical Man’s side of the car remained mostly on the road. The pain wasn’t good. Initially my symptoms suggested multiple organ failure and imminent death but after a few moments I was able to downgrade the diagnosis to a punctured lung. I was groaning and panting quietly to myself when I realised Sabbatical Man was sounding worried. “I’m OK…broken…ribs,” I gasped, sacrificing what little oxygen I had to put his mind at ease. The car door opened and a worried face peered in. Bless. 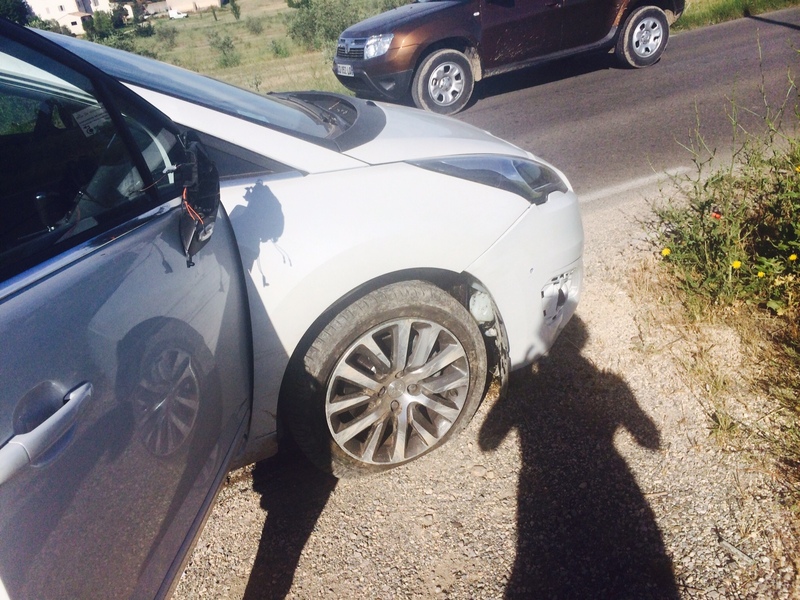 We have seen a great deal of kindness from strangers in Provence. It was now becoming clear that my seatbelt was the reason I couldn’t breathe. I found out later that it has a wee explosive charge that makes it to retract with force to pin you to your seat in the event of impact. In my case it did its job well, then dug in ever-more ferociously under my ribs as we bounced around in the ditch, knocking the wind out of me in a way I hadn’t experienced since Christmas, 1977, test-driving my new rollerskates on Granny’s footpath. Its job done, the seatbelt was now casually smoking – which alarmed our would-be rescuer into thinking maybe we should call les pompiers [fire service]. “Vlah vlah vlah vlah,” I said to the man. It may have been French. It may have been English. Neither of us knew. Whatever it was, he thought it wise to offer his help in both languages, checked again that we were OK, and then sped off, coolly balancing his car on that cotton thread of a road without so much as a wobble. Sabbatical Man was at the steering wheel again. Ninety minutes later, the depanneuse [towtruck] arrived. It was very difficult for the driver to keep his smile under control but he was not a cruel man. “Ç’arrive,” he said [It happens, but I have been driving this really, really big truck on this very narrow road for many years and it has never happened to me]. You should have seen his truck. He put kiwi tow truck drivers to shame. Actually he put us to shame. We spent a good part of our waiting time trying to get the car in order. All those pastry crumbs, biscuits, parts of a rock collection, various herbs, flowers and grasses de pays, not to mention an awful lot of white, Provençal dust from the gravel in every public square and garden, the school playground and our own patio. Hard to pick up with your fingers. The car was not a credit to us. In contrast, the tow truck was sparkling – as was the driver’s smart orange and black uniform. He dropped us 200m up the road at the roundabout so we only needed to walk the remaining 200m home without getting mown down by a passing combine harvester. What is that statistic about x per cent of accidents happening within y metres of home? Someone should Google that. Anyway, the Peugeot Roadside Cavalry lived up to its reputation and had arranged not just the tow-truck but a loan car before the day was out. The car, which had looked not-so-bad from the outside, had suffered the worst injuries of the day and repairs are expected to take weeks. It was the taxi driver en route to pick up our rental car, who gave us the good oil on how to really keep safe on our terrifying road. Our strategy, you see, has always been to stay as far right as possible when facing oncoming traffic. (Sabbatical Man, an engineer in his other life, has calculated that the road is precisely as wide as two standard New Zealand parking spaces). Obviously the bigger the vehicle, the more room we try to give them. This is, in a way, a reflection of our culture. Agreeably making way for others who are bigger, faster or in more of a hurry than you are. Obviously he was unable to see the extent of bruising to my gall bladder or the injuries to Sabbatical Man’s pride. Most importantly, he added: “Il faut aller toujours doucement, doucement, doucement,” [You must always go slowly, slowly, slowly]. Half an hour later in the Avis car park, I approached the driver’s seat but Sabbatical Man wasn’t having a bar of it. “Gotta get back on that horse,” he said confidently. He didn’t hear – he was banging his head on the steering wheel again. Hope you’re not too bruised Karen! We remember those narrow country roads very well. Enjoying reading of your life so far – it all sounds wonderful. ill try the middle of the road from now on…that explains it! Ive only had a flat ( caused by hugging side of road and blowing up tire on sharp tree stump..watch out for those….) . And gayoff put non diesal in car….thats another story. Ha! Don’t run me off the road Barb! Poor Gayoff – that’s quite common, I hear. Oh dear I hope Sabbatical man has his pride intact. I’m milking it, Vick:) He’s not thrilled but lucky it’s not a competition because my collision many years ago with a service station would win hands down. Each country has its own driving culture, I loved racing on the autobahn in Italy even though we only (seulement!) had a little Fiat. In India the drivers all go for the gap, we can’t believe how relatively few accidents there are although lots of dings! There has been another spate of Euro drivers causing deaths on our right hand drive roads. I’m really enjoying your trip Karen!